A design by a Gray’s School of Art student is adding a splash of colour to phones around the world, after it was chosen as the winner in a UK-wide competition. 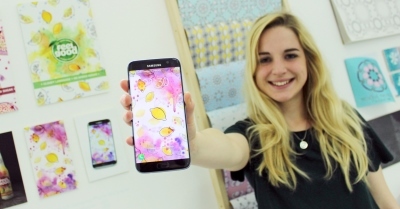 The competition, run by phone company Three, saw budding UK artists and designers challenged to create their own bespoke wallpaper for the Samsung S7 phone model. Sarah Leask (22), a final year communication design student at Gray’s, fought off competition from hundreds of students at universities around the country after her design ‘Lemon Drizzle’ was selected to be shortlisted by a judging panel, then voted the most popular by the public on social media. Sarah said: “I was actually super surprised to be shortlisted at all! I entered on a bit of a whim and by the time the shortlisted entries were released I had almost forgotten about it all together. She added: “I entered the competition as it was sent to us in one of the many emails we get from Gray’s and it just happened to catch my eye. A friend on my course encouraged me to do so as she reckoned my pattern illustrations would look really nice as a phone wallpaper and I figured I had nothing to lose. Sarah said the design originally came from a series of lino-cut and watercolour prints she had been experimenting with and felt that the bold fruity colours would also be attractive on a screen. She specialises in illustration and will see her work go on display as part of the Gray’s School of Art Degree Show later this month. Sarah said: “The run up to the Degree Show is an emotional rollercoaster. I am so excited for it but so stressed about getting everything done and getting my wall space exactly how I want it to look. The Gray’s School of Art Degree Show, which is sponsored by BP for the thirteenth year, runs from June 18 to 25 and will showcase work by students of all disciplines.